My name is Cierra Wells, I am ten years old, and I am a red belt. I will be testing for my brown belt October 28, 2011. 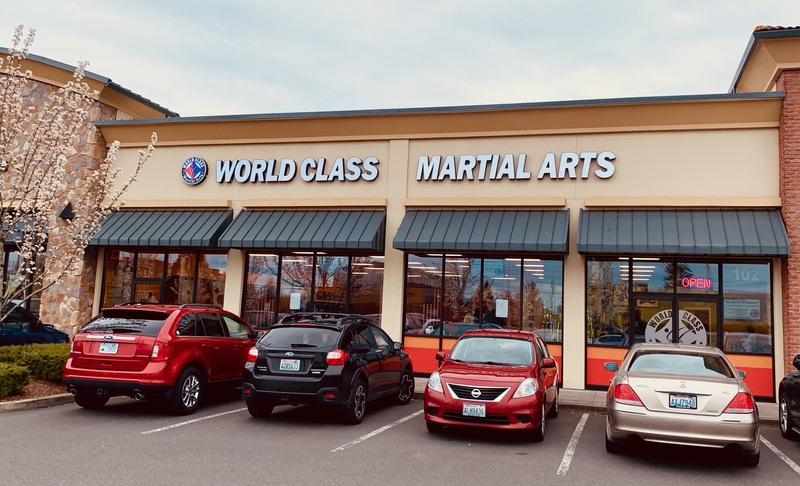 My brother and I started Taekwondo together, September, 2010 at U.S. West Coast Taekwondo. I was nervous at first. When I first started Taekwondo I didn't have a lot of confidence in myself. Taekwondo, my instructors, and my family have helped me to overcome this. I am very confident now. I have broken up to three boards at one time, performed in front of large groups, competed in a tournament, and I have led our groups. It is exciting and a lot of fun! When I became a yellow belt, I joined our school’s Black Belt Club. After joining I was able to take weapons classes. I have gotten to learn how to use nun chucks and the sword. We have also had basic Hap Ki Do training. I got invited to join the Demonstration Team when I was an Orange belt. This has been exciting for me. Our team performed at our school’s open house. I was really nervous; we had several important guests visiting. A Chief Grand Master and a Chief Master came from other states to see our new school. There were also a lot of other people watching. Our team has also performed for a Black Belt testing, at the elementary school that I attend, in a parade, and at a fundraiser for St. Jude’s. Being on the demo. team has taught me how to perform in a group. We have a form, board breaking, and sparring techniques that we do. It is so much fun. I competed in the 2011 U.S. National Open Taekwondo Championships, as a green belt. I received a bronze medal form my individual form. My brother and I received silver medals for our synchronized form. I really enjoy sparring classes. I started sparring after becoming a green belt. I like to watch my competitors and see what techniques they use. Sparring is very exciting for me, I like the challenge. I attend my classes regularly and I practice my forms and other requirements every morning. I plan to attend the U.S. West Coast Taekwondo tournament in March 2012. I hope to be on our school’s national sparring team by then. I enjoy taekwondo and I want to learn all that I can about it. I also want to share what I have learned with others. Taekwondo has helped me to be a better student, sister, daughter, and friend. I take what I learn in Taekwondo everywhere I go. I wish that everyone could learn what I have learned. As a white belt I learned my form, kicking combinations, one step sparring, and breaking techniques. The most important lesson I learned was how to bow. Bowing is a sign of respect. We learned to salute the Korean and United States flags, how to be respectful to our instructors and the other students, how to focus, and to count to five in the Korean language. Before we could test for our yellow belts we also had to learn the family code. This is a guide on how to be respectful to our families and friends. At our school we have to learn a form, breaking technique, one step sparring, and kicking combinations for each belt level. We also learn to use our manners, some of the Korean language, and how to help others who may be struggling with their techniques. When we are getting ready to test we have to have a form filled out and signed by our teachers and parents to make sure we study hard and that we are using our manners. 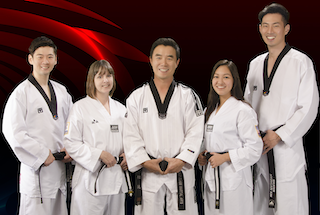 As a U.S. West Coast Taekwondo student we are also taught to respect ourselves, our uniforms, our belts, our school, and our equipment. We are rewarded for our hard work and attendance. Our instructors make our learning fun. Our school's Chief Grand Master is Chief Grand Master Jay K. Shin. He is the founder of our school. Chief Master Instructor Sang Bum Yun is the owner and chief instructor of our school. Master Park is our master instructor. Chief Grand Master Shin, Chief Master Yun, and Master Park are from Korea. We also have four junior instructors. Master Park, Mr. Phillip, and Mr. Trey teach most of my classes. Taekwondo is not just learning how to kick and punch. We are taught how to focus, how to be patient, and how to set goals. We are also taught, self-control, responsibility, to never give up, cooperation, confidence, excitement, and respect. All of our belt levels have a meaning that helps us to remember these life lessons. As a white belt we are new and taught how to focus. Yellow belt is when we begin to grow and we are taught to be enthusiastic. Our technique starts to form at the orange belt level. This is when we learn about setting goals. Green belt is when we are growing and learning how to cooperate. We start to realize our potential and learn about self-control as a purple belt. Blue belt is when we start to progress and we learn to never give up. Strength and confidence is the red belt level. This is where we learn about confidence. Brown belt and senior brown belt is when you begin to be stable both mentally and physically. Here we learn about respect. We are taught responsibility as poom belts. This is when we start to show honor, respect, and maturity. As a black belt we have come to the end of one path and we begin a new one. I have been told that this is the beginning of our true training. I am excited about becoming a black belt. I know that it is going to be hard work, but it will be worth it. My main goal in Taekwondo is to be the best and the highest black belt that I can be. I work towards this every day.